UNITED NATIONS (AP) — The U.N. human rights chief defended his outspoken criticism of abuses in dozens of countries from Myanmar and Hungary to the United States, insisting that his office doesn't "bring shame on governments, they shame themselves." Zeid Ra'ad al-Hussein stressed at a farewell news conference at U.N. headquarters on Thursday that "silence does not earn you any respect — none." Looking back at his four-year term as U.N. high commissioner for human rights, the Jordanian prince said he will give his successor the same advice his predecessor, Navi Pillay, gave him — "be fair and don't discriminate against any country" and "just come out swinging." Zeid said he leaves the Geneva-based post on Aug. 31 very concerned about populism, intolerance and oppression "becoming fashionable again." "It all builds because once you start down the path of intolerance, it's very difficult to stop it, unless at the end of the day you have conflict," he said. Zeid said the question he has been asking populist leaders in Hungary, Poland and Austria — who are making political gains thanks in part to their opposition to mass migration — is where do they want to see their countries in 2030. If the trend is going to be "increasing authoritarianism" where countries pursue individual agendas, he said those agendas will collide "and eventually we have what we've already seen in the 20th century." Zeid recalled that it took 100 million lives lost through two world wars, the Holocaust and the Spanish influenza epidemic "to drive humanity to the point where it recognized that it had to begin to do things differently." That led to the formation of the United Nations where countries would try to solve problems together, "not at the expense of one another," he said. But if the populists are allowed into "this space," Zeid said, "I think we're in very perilous waters." He was highly critical of militant attacks, but stressed that "the world is not going to break because of these terrorist outrages." "It will break because of the overreaction or the exploitation of this agenda by governments," Zeid said. He cited as an example a study by the U.N. Development Program on recruitment by armed groups in northern Mali that found 70 percent of respondents said the major cause was excessive use of force by security forces. "We have to put up a mirror before all governments," he said. "They shame themselves when they deprive their people of their basic necessities for a dignified life. They shame themselves when they discriminate against parts of their communities. They shame themselves when they stoke fear and make people fear that they have to bend to the will of the government or face consequences." "If an election has been stolen, rigged, by a corrupt government and then they claim that I can't say anything because I violate their sovereignty, whose sovereignty?" Zeid asked. "Sovereignty always lies with the people. It's exercised by government on people's behalf." Zeid said governments put a lot of pressure on him and his office, but "the real pressure comes from the victims" whose human rights have been violated in Syria, Iraq, Congo and many other countries "because you know the limitations of what you can do." The most meaningful part of his work is stopping an execution, getting someone who has been detained for years released, and successfully pushing for human rights adherence — and then receiving a letter of thanks from the family or the individual. "We have to speak, and we have to engage," Zeid said, even if it poses difficulties for other U.N. colleagues including Secretary-General Antonio Guterres. "Sometimes we make mistakes and I have apologized publicly to governments," he said. But "if I'm going to make a mistake, I'd rather make the mistake speaking out and not regretting that I didn't say anything when I should have said something." 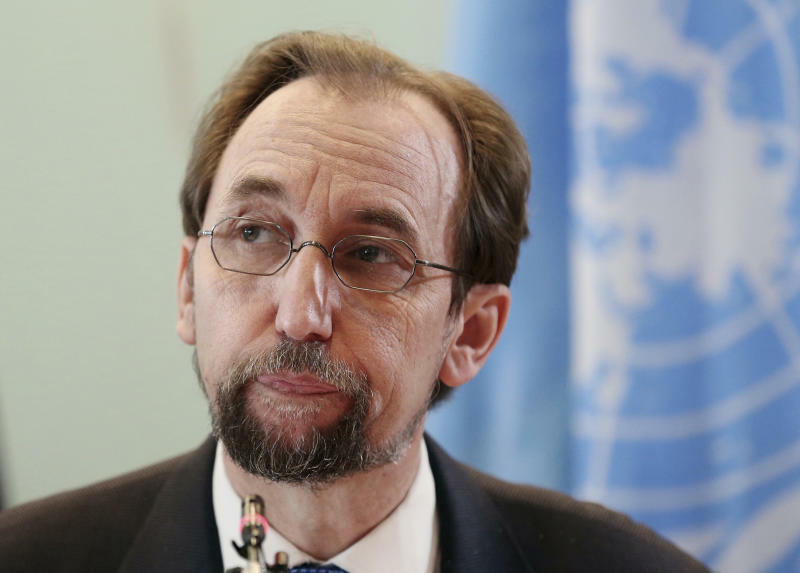 Zeid cited human rights investigations the Human Rights Council has authorized in Syria, Myanmar, Yemen, and most recently in Venezuela and Nicaragua. But he said his greatest success has been demanding access for rights officials. He said when access is barred, including in Myanmar's Rakhine state where about 700,000 Rohingya Muslims lived before fleeing a violent military crackdown last year, and Venezuela, he asks: "What are they hiding?" The United States pulled out of the Human Rights Council in June, citing "chronic bias against Israel." "I think we've been fair with everyone and firm with everyone," Zeid said. "The suggestion that I'm an anti-Semite and my office is, I find it really disgusting." As for President Donald Trump, Zeid again denounced his repeated attacks on the media. He said that he felt as if "all of us, humanity, were at the back of a bus and the president was driving the bus, and we're careening down a mountain road with steep cliffs on either side, and there is this sense that as one of the principal leaders of the world not knowing clearly where he wants to take us. What is his end point?" He said he didn't seek a second term because the five permanent members of the Security Council — the U.S., Russia, China, Britain and France — need to give their approval and he knew a long time ago that he wouldn't have the support of at least three and probably all of them, "which I was happy about." "I have no regrets that I've said what I said," Zeid said. "I think I've tried my best and I hope others will see that at certain times the U.N. needs to speak." Several candidates for the job reached out for advice, and Zeid said he told them that "it's an extremely meaningful job — the most meaningful job I've ever had — but very trying as well, and that they shouldn't think of it if their health is not perfect."